Thinking About Upgrading Your Home’s Exterior? It could be that your home´s exterior isn´t looking as new as it used to look before. If so, you might decide to give your house a facelift. What are your options? Well, instead of splashing the cash on every bit of furniture you can find, we would strongly suggest that you to shell out your money for new siding. Not only will new siding boost your curb appeal, but it will also considerably increase the overall value of your home! While maybe not as tempting as other projects, it is beneficial for homeowners to focus their remodeling on exterior replacement projects such as siding. Those types of projects provide the best bang for the buck in terms of resale value. Basically, you will be able to recoup a larger percentage of your investment on exterior remodeling projects such as new siding. In fact, if we are to be more precise, you can expect to recoup around 80% of an investment in new vinyl siding at resale and up to an impressive 79% on fiber-cement siding. New siding is a huge aesthetic improvement. However, the benefits of new siding don’t stop there. Siding performs the notable task of protecting your home from the elements, whether it’s a nonstop drizzle, heavy rains or more serious precipitation. In addition to that, siding is also a way to increase your home´s energy efficiency and repair structural damage. When you remove your old, ragged siding, you have the opportunity of replacing or adding insulation before installing your new siding, thereby increasing the energy efficiency of your home. New siding will typically coincide with a house wrap that adds a critical layer of insulation and moisture protection. The more energy efficient your home is, the more dollars you save on energy bills throughout the year. Not to mention, the removal of old siding also enables the contractors to repair any kind of structural damage caused by leaks or dry rot from the outside without the mess, hassle, and extra expense caused by disturbing your home´s interior. In a nutshell, a superior siding job adds real value, protection, and curb appeal to your home, providing you a not insignificant return on investment. Although we have many options to choose from when it comes to different products and services, too many options can prove challenging. There are different types of siding available, and each type boasts different features. In the end, your choice should largely depend on your preference, needs, and requirements. Vinyl siding is generally the most popular choice amongst buyers in the United States. There are many reasons why vinyl siding is a popular choice. Vinyl siding is tough and durable and it doesn’t reveal scratches and nicks because color permeates it through and through. In addition to that, it is also available in a wide variety of styles and designs. It is so popular and useful because it doesn’t rot, crack, dent, or warp. It doesn’t peel or blister, either, and as a construction material, it never needs sanding, scraping, or painting. Modern vinyl siding is specifically manufactured to retain its shape and integrity even in the harshest of weather conditions. It helps that this type of siding is lightweight and can also be retrofitted over existing siding, making it a versatile choice. What we love about modern vinyl siding is also the fact that it requires minimal maintenance. Many top-quality brands even offer transferable warranties on modern vinyl siding; those offers can prove to be an attractive selling point particularly when your house goes on the market. 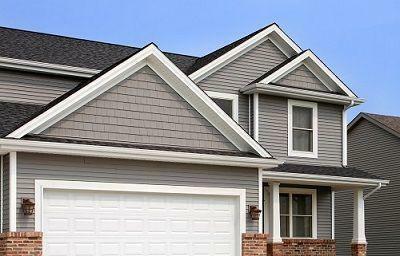 Another popular option, and the preferred siding of EvoSiding, is fiber-cement siding. As the name would suggest, it’s made out of a combination of cement, cellulose fibers, and sand. It is five times thicker than vinyl, but it can be made to look like wood and retain that look even after adding layers of paint. If you’re a person who likes to change the exterior appearance of your house from time to time, you can paint your fiber-cement siding for a new look any time you want. Fiber-cement siding requires little maintenance and is quite resistant to harsh weather conditions, insect infestations, and even fire. Therefore, it can be stated that it doesn´t lack in the durability department. 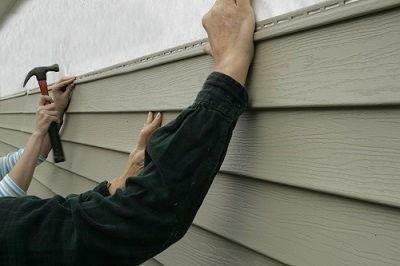 But most importantly for the homeowner on a budget, fiber-cement siding is cheap and affordable. However, if you are a big fan of natural materials and don´t mind the extra maintenance work, we would recommend that you go for wood siding. Wood siding is easy to install and replace. Be advised that you´d have to repaint and re-stain it periodically, though. You’ll also need to take some preventative measures, since wood can be vulnerable to insects, fungus, weather, and UV radiation. Otherwise, the wood can warp and rot with time. When installed correctly, wood siding is a durable choice and can easily last a century or more with proper care and maintenance. Most importantly for the environment, however, wood siding is completely biodegradable. A lot of siding options try to imitate the look of wood, but nothing can truly replace the real thing. Choosing the right siding gives your house a new look and feel that can also save on energy costs. Take a look at your budget and your house’s needs, and then consider the different types of siding available. With a little bit of research, you can find the perfect siding that provides great curb appeal while also protecting your investment in your home.